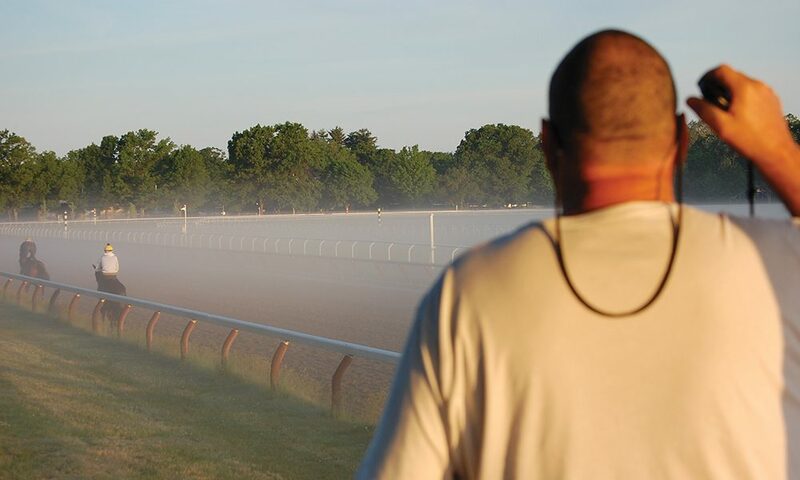 'saratoga living' contributor Joe 'Woody' Wood spends a full day with the trainer, who's made an indelible mark on Saratoga racing. Training racehorses isn’t an easy job. At all. Some trainers do it for the love of the sport or the money, while others do it for the fame and glory and horses (or all of the above). It’s a sport and a game and a hobby to those outside the barns, but beyond the fences and security, it’s a taxing job that’s accompanied by the highest highs and lowest lows—not to mention pressure, especially to succeed, and succeed now, as owners often get in the game to win and only win. It takes up all of a trainer’s time, and a trainer gives up everything in his or her life to do the job successfully. It’s a mission and a goal that demands excellence, patience and stick-to-it-ive-ness beyond one’s common imagination. It’s a tiresome seven-day-a-week responsibility that requires you to be a master of everything horse-related, including having an abundance of medical and psychological expertise, as well as being a management guru to your staff. Because let’s face it, without a great staff, any attempt at success would be futile. Sure, you ultimately want to win and produce winners and make money, but in reality, nothing matters more to a horse trainer than his horses’ well-being, and that’s especially true of trainer Eric Guillot. Intentionally, Eric only has a limited number of horses in his barn—just 11—and cares for them every day, all the time, usually from their birth on the farm to their first step on the track (if they end up competing). That sort of barn management can have its advantages. Plus, he literally trains every single horse himself. OK, so he may not ride his horses around the Oklahoma training track physically, but he watches their every step, monitors their every breath and observes their every thought and physical tendency and always considers what’s best for them. He’s so knowledgeable about each individual horse that he can often address issues before they even happen. Generally, trainers arrive at the track every day of the week around 5am—some earlier, some later—and I meet up with him for my horse trainer-shadowing session, at 5am sharp. At the barn, his eight staff members are already in full working mode (their days begin even earlier, between 3:30-4:30am), each with his own individual responsibility. Eric meets with his longtime friend and most trusted staffer, Sixto, who’s been with him for the last dozen years. They go over the day’s preplanned schedule for each horse (it’s set days in advance) and talk about what may have been going on in the barns or with the horses’ health, then break the huddle to get it all going. Next, Eric takes me to each stall and introduces me to every horse, walking me through their backgrounds. Currently, all of Eric’s horses are part of Southern Equine Stable LLC, which is made up of Eric and his best friend, Mike Moreno. Yes, he’s the namesake of the horse Moreno, who won the largest payout in Saratoga racing history—sorry, Secretariat—in the $1.5 million Whitney Handicap in 2014, with an upset of the great racehorse Palace Malice. No other trainer in the history of Saratoga can make that claim, and deservedly so, he’s damn proud of it. 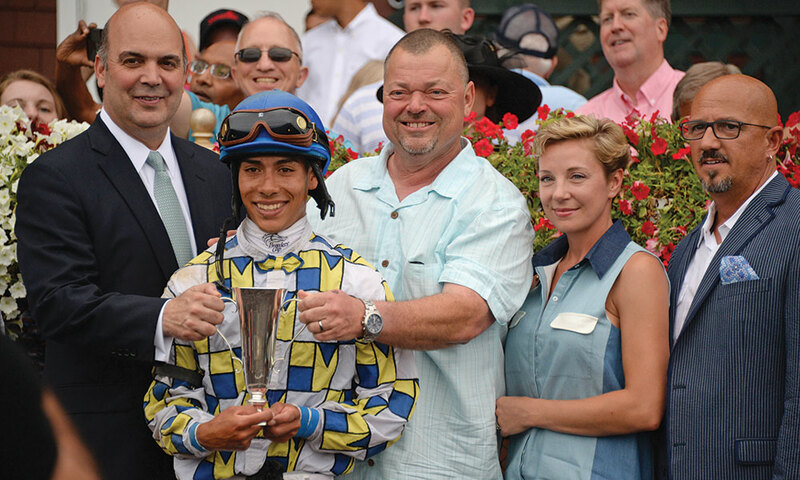 Moreno also missed winning the Travers Stakes by a nose at 30-1 odds in 2013. So close. It’s now 5:45am, and we’re ready for the first two horses to hit the training track. Exercise riders Alex and Riccordo get their final instructions from Eric about what they need to accomplish, and we slowly follow the horses across the street. All the while, Eric’s watching their every step, while sharing some inside tips and training secrets with me. Then he says they’re ready to go. From my vantage point, the horses gallop well, running fast and finishing out strongly. They’re just physically beautiful, and both look like sure winners—but not to Eric just yet. He’s a little disappointed that one of them didn’t really show enough effort today, unlike the horse’s last bullet work (i.e., the best workout time for that specific distance). He explains that this isn’t out of the ordinary, though, and like people, horses sometimes have bad days: General soreness from a workout or a sudden mood swing could affect the way they perform. But he assures me he’ll double- and triple-check them when we return to the barns. After asking Eric a plethora of crazy questions, he shares with me the importance of knowing every detail about every horse, including each horses’ medical history—from the daily aches and pains to the slightest change in step, stride or mood. He even knows his horses’ complete breeding records by heart. “Every little bit of knowledge is imperative in knowing how each individual horse should be cared for,” says Eric. “Each horse’s well-being is dependent on this knowledge because nothing is more important than the horse’s health. Not even winning.” This reminds me of the 2014 Whitney, when Eric not only earned the greatest victory of his career with Moreno, but also suffered its most tragic loss, when his promising two-year-old colt, Sir William Bruce, died right after his debut race. Watching a grown man cry is never fun. Eric was devastated by the loss. He loves his horses. While losing a horse is not the part of the sport anyone likes to hear about, that day showed me just how much these trainers really care for their horses. Having spent the entire day shadowing Eric, I came away with this big lesson: Being a trainer isn’t as easy as it looks, and in order to be a successful one, you have to make a ton of sacrifices. It’s your full-time job and lifestyle. If you happen to run into Eric at the track this summer, don’t hesitate to say hello and ask him a friendly question or two. He’s easygoing, loves to impart racing knowledge and is truly an expert in his field. Simply put, he’s a proven winner. For more musings by Joe “Woody” Wood, read his regular column, “Woody’s Horse Hunch,” exclusively on saratogaliving.com. Joe "Woody" Wood is the Owner/Master Barber at Woody's Barbershop in Saratoga Springs, NY. Before that, he worked as a restaurant manager and private bartender in Las Vegas. Woody's an avid horse racing fan and enjoys live music.